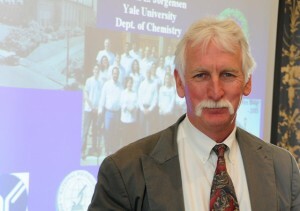 William L. Jorgensen, Sterling Professor of Chemistry. Sterling Professor of Chemistry William L. Jorgensen was recently elected to the International Academy of Quantum Molecular Science (IAQMS) – a distinguished academy founded in 1967 that has boasted a total of 138 members, including luminaries such as de Broglie, Hund, and Pauling. The IAQMS promotes collaboration and research in quantum chemistry, hosting an international congress every three years and awarding an annual medal to an outstanding young scientist in the field, an award which Jorgensen himself received in 1986. Jorgensen began studying quantum mechanics at the age of 18, conducting research as an undergraduate at Princeton University. At the time, computers were not very powerful, and quantum chemists were limited to studying relatively simple systems, such as isolated molecules in the gas phase. However, as computing power increased, Jorgensen sought to incoporate solvent molecules into quantum mechanical models, motivated by the fact, as stated by Jorgensen, that “most experimental chemistry is done in solution.” To this end, he developed several widely-used models for water and organic liquids. 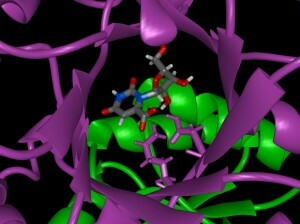 This image is an example of the computer modeling employed in the Jorgensen Lab. This shows the occupied active site of a phosphate decarboxylase. Image courtesy of UCSF Biophysical Society Symposium. International3: William L. Jorgensen, Sterling Professor of Chemistry. International4: This image is an example of the computer modeling employed in the Jorgensen Lab. This shows the occupied active site of a phosphate decarboxylase. Image courtesy of UCSF Biophysical Society Symposium.